Satellite phone sector is open for all: Telecom Minister. TRAI to discuss tariff floor price with telecom companies on July 21. Govt to revamp sourcing, testing of telecom gear. What is new in the telecom industry? DoT diverted Rs. 33,682 crore from USO fund meant to provide telecom services in rural India. Corporate Office letter to Union bank regarding loan recovery . Closing of BSNL Offices in Maharashtra Telecom Circle (Maharashtra 7 Goa States) in connection with General Election of Lok Sabha 2019 - Reg. Deduction of salary for strike period held from 18/02/2019 to 20/02/2019. Guidelines relating to Transfer and Posting � rationalization of expenditure regarding. Holding of Local Council and Works Committee meetings. Turnaround of BSNL being devised by @DoT_India & @BSNLCorporate includes allotment of 4G spectrum & offering lucrative VRS to willing staff. Reduction of retirement age or laying off employees is not at all being considered. BSNL denies any such media appearances in this regard. LIST OF EMPANELLED HOSPTAL IN MUMBAI AREA . LICE for promotion of Group C to the grade of JTO(T) under 50% quota for VY 2017-18 scheduled on 28.04.2019-Pre-recruitment Training to SC/ST/Minority candidates & E-verification . Government considering attractive VRS, bonds, 4G waves for BSNL, MTNL revival: Official. It is reliably learnt that the PMO today hold the meeting on revival of BSNL/MTNL. The Meeting was chaired by the Principal Secretary to the Hon�ble Prime Minster. Secretary (T) along with some Senior Officers of DoT and CMD BSNL/MTNL attended the meeting. On revival of BSNL Plan, CMD BSNL gave the Presentation wherein DoT has been asked to submit the Note based on the discussions and decisions taken in the meeting at the earliest. It is understood that PMO has assured to allocate 4G Spectrum to BSNL immediately, Monetization of BSNL's non-core land may be decided by DoT and VRS to BSNL employees will be applicable from the age of 50 onwards instead of 56 years age ( About 1,10,000 BSNL employees comes under the age of 50+ ). DoT/BSNL will submit the final draft on the basis of the discussions and decisions to PMO shortly. PMO also clarified that BSNL should exist and immediately no disinvestment is proposed. Reduction of age from 60 years to 58 years is ruled out by PMO at present. Closing of BSNL Offices in Maharashtra Telecom Circle and Goa in connection with General Election of Look Saba 2019. Induction Training for promotion to Sr TOA (G) . The Prime Minister�s Office (PMO) has convened a meeting on April 2 to deliberate on the revival of state-run telecom firms BSNL and MTNL, which have been facing severe financial crunch with mounting losses and stagnant revenues. Both the firms failed to pay February salary on time to their around 2-lakh-strong combined workforce. The Department of Telecommunications (DoT) has been engaging with the firms for some time now to work out a solution. Clarification regarding Cash Payment in lieu of supply of Towel,soap. IDA increase w.e.f 1.4.2019 : Consumer Price Index (IW) for the month of February 2019 remained stationary at 307. Basing on the 3 months average, IDA increase from April 2019 will be 2.6%. Total IDA - 141.4%. Meeting between CMD BSNL and the representatives of the AUAB: A meeting between the representatives of the AUAB and Shri Anupam Shrivastava, CMD BSNL, was held today the 28.03.2019. Ms. Sujata T. Ray, Director (HR) was also present. The following issues were discussed. (1) Imposition of break-in-service under FR 17 A: The AUAB has already written to the CMD BSNL, stating that break-in-service under FR 17 A, cannot be imposed on BSNL employees, since it is not part of the CDA rules. In today�s meeting, the representatives of AUAB insisted for expeditious action by the Management, on this issue. The CMD BSNL and the Director (HR) assured to do the needful. (2) Wrong calculation in the wage cut: The representatives of the AUAB pointed out that the wage cut, for participation in the 3 day strike, has been done based on wrong calculation. That is, the three day wages has been arrived, by taking 28 days as a month�s salary. Instead, a month�s salary should be calculated as 30 days. As a result, more money has been deducted from the salary of the employees. Further, three days wage cut should be calculated on basic pay and DA only. But in many places, this calculation has been done wrongly. The CMD BSNL and Director (HR) assured to do the needful on this. (3) March to Sanchar Bhawan - provoking instruction given by the BSNL Corporate Office: The SR Branch of the BSNL CO., has sent an instruction to the CGMs, directing that the principle of �no work no pay� should be implemented on those employees who take part in the March to Sanchar Bhawan. It was pointed out by the AUAB representatives that, as per rules, the principle of �no work no pay� cannot be imposed on employees for their participation in the rallies. Responding to this, the Director (HR) said that, she was not aware of any such instruction having been issued by the Corporate Office, and assured to look into it. The CMD BSNL informed the representatives of the AUAB that, the March salary will be paid to the employees on time and he alsotold that this payment of salary is being made purely from BSNL�s own earnings. Compliance of provision of applicable Labour Acts - Maintenance of records regd. letter from circle office to Divisional Sports & Cultural Board for Submission of Receipts & Payments Accounts along with the Audit Certificate of Divisional Sports & Cultural Board for the year 2018-19. Letter from circle office asking information regarding Holding of Local Council and Works Committee meeting. 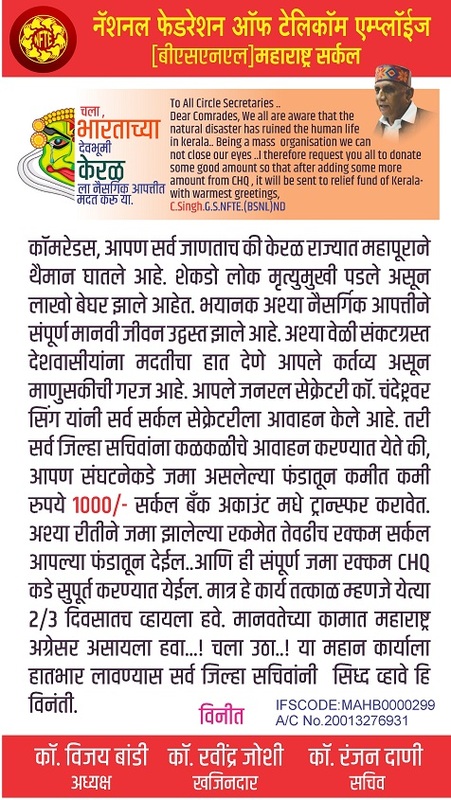 Akola SSA- Extension of empanelment service period of ICON Hospital Akola & Removal of some pathological tests. REVISED PROCEDURE/SCHEME FOR COMPASSIONATE GROUND APPOINTMENT CASES. Waiver of Outdoor medical treatment limit for the specified chronic disease. 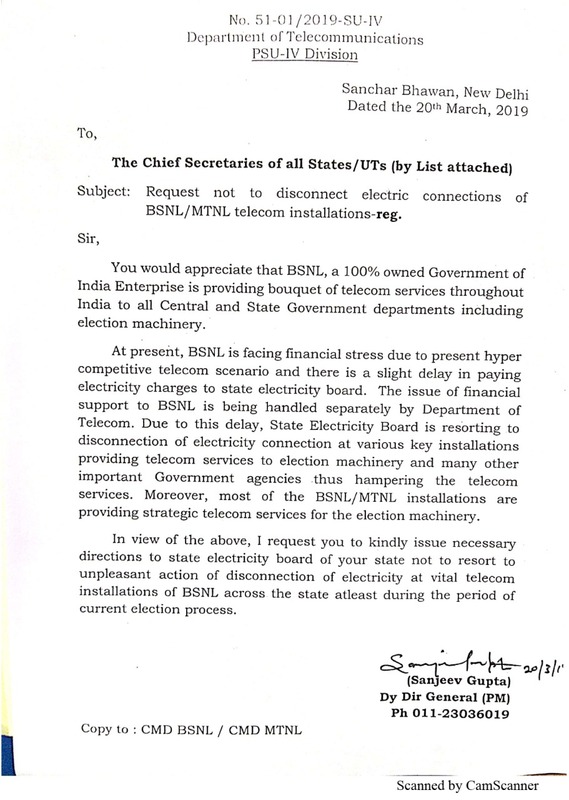 Letter to all State Chief Secretaries from DOT requesting NOT to Disconnect Electricity Connections of BSNL/MTNL Telecom Installations. Corporate office issued letter regarding the 19th all INDIA BSNL sports and cultural Tournament 2019-20 suspension. BSNL may become a dividend-paying operator if voluntary retirement scheme gets Centres nod. The AUAB has decided to organise a massive Rally to Sanchar Bhavan on 05.04.2019. It has decided to invite the leaders of all political parties to address this rally. All the Circles and SSAs are requested to mobilise the maximum number of employees for the rally and to make it an historic event. The AUAB held a meeting with the CMD BSNL today morning, regarding payment of salary. 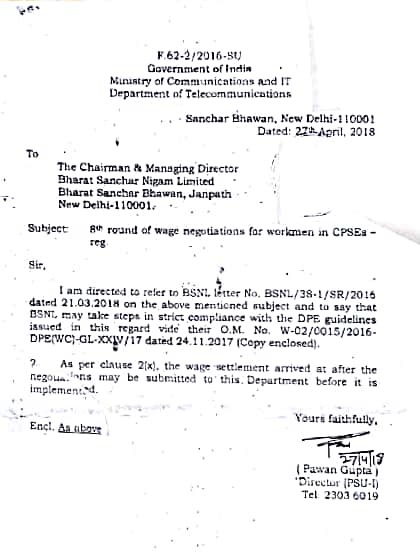 It is assured by the CMD BSNL that the February salary will be disbursed by 20-03-2019. Exemption of Staff and Vehicles of BSNL from election duty- regarding. General instructions to join educational institutions outside normal office hours for pursing higher qualifications in respect of Executives-Non-Executives of BSNL. Policy Guidelines for promotion of Wings Service Connections of BSNL. 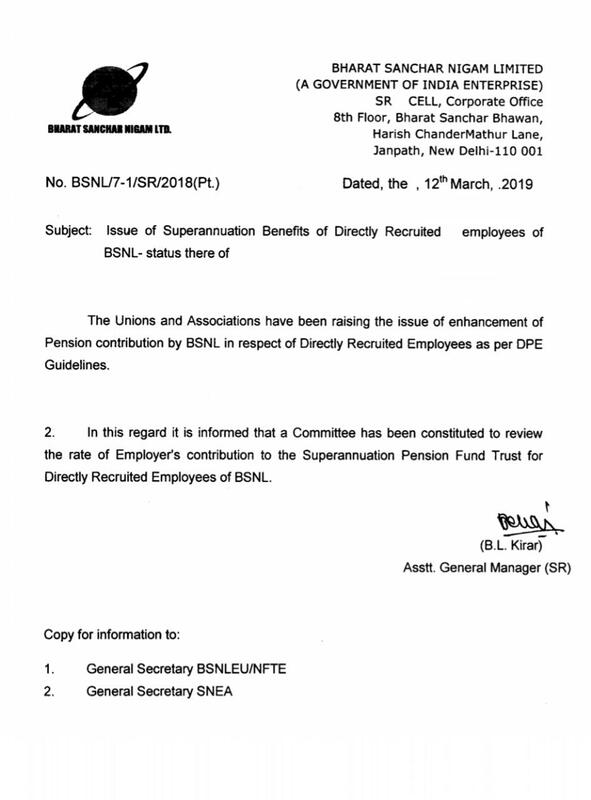 Superannuation benefits for DR employees of BSNL - Formation of Committee to review the employers contribution. AUAB writes to Hon MoSC requesting urgent support to BSNL for availing Bank Loan for the maintenance of network. "DPE Guidelines for Administrative Ministries/Departments and Central Public Sector Enterprises, 2019"
Meeting with Shri Anupam Shrivastava, CMD/BSNL: AUAB leaders met CMD/BSNL and held discussions regarding payment of salary for the month February, 2019 and the repressive measures initiated under FR 17A against the employees participated in the strike, especially the Executives. GSs and senior leaders were present in the meeting. DIR(HR) was also present in the meeting. CMD informed that the salary will be paid by next week end, according to the present cash flow. On the repressive measures, AUAB explained that FR 17A is not part of CDA Rules or it is not adopted by BSNL so far and hence it is not applicable for BSNL employees. The action initiated under FR 17A is not valid, AUAB explained to management. Accordingly, the proposed Relay Hunger fast by CHQ leaders of AUAB at New Delhi from 12.03.2019, demanding salary payment and withdrawal of repressive measures deferred. AUAB to organise hunger strike at Corporate Office. The AUAB conducted it is emergent meeting today the 07.03.2019. General Secretaries /Representatives of AUAB attended the meeting. Meeting discussed the following. 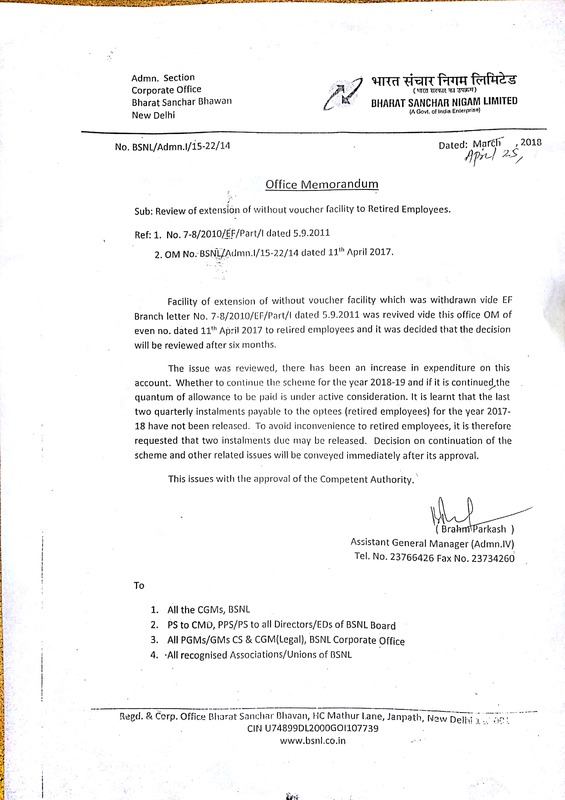 Non-payment of salary to the BSNL Employees for the month of February 2019. Vindictive actions against AUAB Leaders, particularly leaders of Executive Associations. Issues in the charter of demands submitted by AUAB. After discussion at length on the above issues, following decisions were taken unanimously. To meet CMD BSNL, immediately after the meeting, on the issue of non payment of salary of Feb 2019 and vindictive actions. Allocation of final welfare grant and Submission of Receipt & Expenditure Statement for the year 01.04.2018 to 31.12.2018 and requirement of fund for the year 2018-19. Report from CHQ :AUAB Leaders Meeting with Director (CFA/CM/Finance) Shri Vivek Benzal : AUAB Leaders met Director (CFA/CM/Finance) and expressed their serious concern and protested against the non-disbursement of February 2019 Salary to all the Circles except BSNL Corporate Office, Kerala, Odisha and J&K Circle. AUAB Leaders also informed the Director (CFA/CM/Finance), this partial attitude of disbursement of February 2019 Salary in a selective manner to some of the Circles created frustration and demotivation among the BSNL Employees. Director (CFA/CM/Finance) informed that he has taken over the charges of Director(Finance) today morning only and assured AUAB Leaders to analyse the financial condition and to take immediate action for the payment of the February 2019 Salary. He further mentioned that Circles are demanding funds for Operation and Maintenance which also needs to be seen. AUAB Leaders requested the Director (CFA/CM/Finance) for the immediate release of funds for the disbursement of February 2019 Salary so as to achieve all the targets before 31st March 2019 and to maximize the revenue by the BSNL Executives and Non-Executives with full motivation. Director (CFA/CM/Finance) assured that he will try to sort out the issues within this week. He informed that the BSNL Management is writing a letter to Secretary (T) for enhancing the Ceiling Limit for availing CAPEX Loan which will be discussed in the BSNL Board Meeting most probably in the next week and after the Board approval it will be sent to DoT for consideration. AUAB calls upon Executives and Non Executives of BSNL to organise Demonstrations on 1.3.2019 protesting non payment of Salary for February . March to the PMO is postponed in view of the tension prevailing in the border: In continuation of the 3 day strike, the AUAB had given call to organise a March to the PMO on 06.03.2019, for pressing the settlement of the demands. However, tension is building up in the India Pakistan border. In view of this situation, the AUAB has decided to postpone the March to the PMO. Next date of the March will be announced in due course. AI CPI (IW) for the month of January 2019 increased by 6 points and stood at 307. EL and CCL shall be taken into account for computing Minimum Residency Period DoP & T instruction. Specialist OPD consultation charge at CGHS empanelled Hospitals . 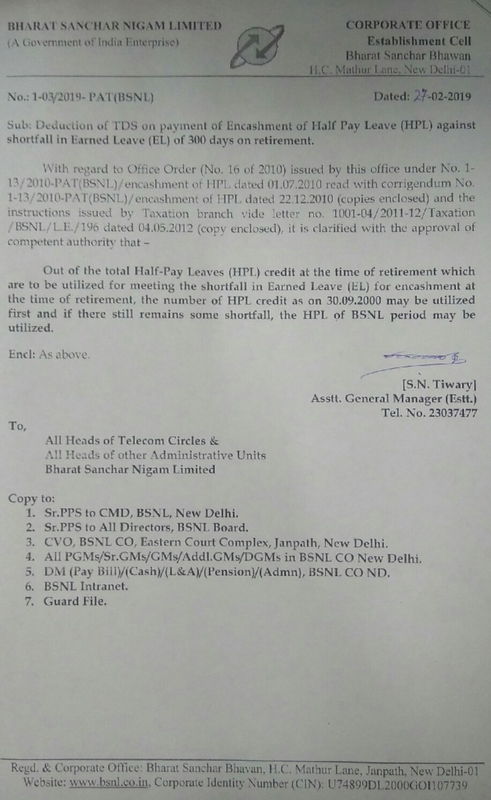 BSNL Corporate Office, New Delhi issued clarifications on deduction of TDS on payment of Encashment of Half Pay Leave (HPL) against shortfall in Earned Leave (EL) of 300 days on retirement. Clarification on Counting of past-services of Ex-servicemen for reckoning 5 year of regular service towards eligibility conditions of JTO LICE 2016-17.
Review of results-failed SC-ST candidates on LICE_Corp off order. Decisions of the AUAB meeting held on 20.02.2019 at New Delhi. A meeting of the AUAB was held today to review the 3 day strike and also to chalk out the future course of action. General Secretaries / Senior officer bearers of all the constituents of the AUAB participated. The meeting whole heartedly thanked the entire Executives and Non-Executives who made the 3 day strike a historic success. The meeting also congratulated the circle and district level AUAB, for effectively organising the strike. With the view to carry forward the movement further to settle the charter of demands, the following programme of action is finalised. 3) To send messages to the Hon�ble Prime Minister and Hon�ble Minister of State for Communications on Twitter. 4) Meeting the Hon�ble Minister of State for Communications wherever possible by our comrades. The AUAB conducted its review meeting on 19.02.2019 evening. AUAB congratulate all the employees participated in the strike. The meeting also took serious note of the letter issued by the Corporate Office, threatening to take action under FR 17A. The meeting resolved to inform the employees that, this attempt of the Management would be stiffly resisted by the AUAB and all the employees will be protected. The meeting also took note of the strike particulars of the various Circles, circulated by the Corporate Office. The figures are factually incorrect. Finally, the meeting decided to take all out efforts to organise the 3rd day strike more effectively. Strike continues with the same intensity for the 2nd Day. The 2nd day strike of the Executives and Non-Executives in BSNL is going on as successfully as it was held on the 1st Day. Encouraging reports are coming from throughout the country. Demonstrations are being organised in each and every place, condemning the government for not allotting 4G spectrum to BSNL, for creating road-blocks in the financial revival of BSNL and also for not settling the 3rd Pay Revision. 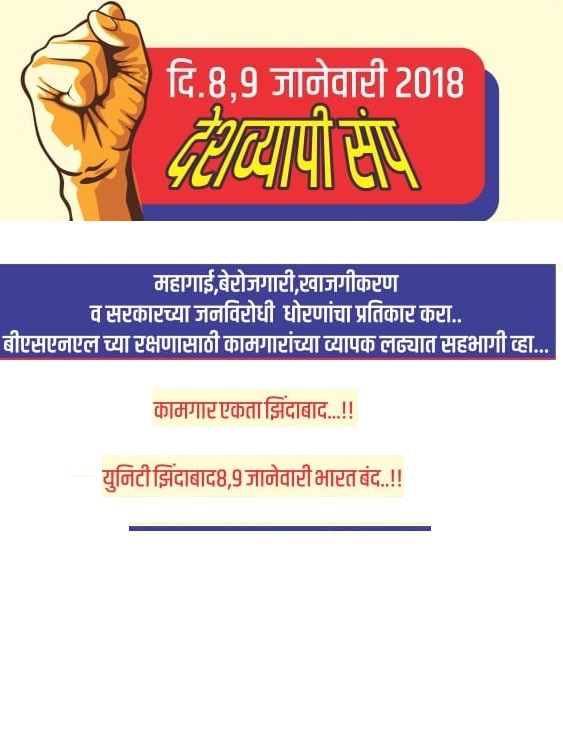 NFTE Maharashtra Circle Branch heartily congratulates all the comrades and requests to organise tomorrow�s strike also in the same intensity. Media Report: Government not sincere to resolve BSNL problem, delaying decision to benefit private telecom: BSNL union . First day strike a Grand success - Maharashtra circle congratulates the employees. The Maharashtra AUAB has heartily congratulates the Non-Executives and Executives of BSNL, for making the 1st day strike a Grand success. As per the report received from SSA, the 1st day strike is near total. It is also observed that the strike is taking place in a totally peaceful manner. 3-day Strike implemented successfully in its first day. In the first day of the three days Strike call given by AUAB has been successfully implemented throughout the Country. Many Circles, it is reported that about 90 to 95% Employees have actively participated in this Strike. The reports of all the Circles are very encouraging. DOT through PIB has given the Press release that DoT reiterates that positive steps are being taken by the Department in respect of all the demands. But the fact remains that due to non-settlement of the demands even after the assurances given by the Hon�ble MOSC(I/C) to the AUAB Leaders in the meetings held on 24.2.2018 & 3.12.2018 for the settlement of the demands of AUAB. No proper steps are taken by the DoT Administration/BSNL Management for the settlement of the legitimate demands which has forced AUAB to go on 3 days Strike. After the AUAB Strike Notice served on 1.2.2019, DoT Administration has not called the AUAB Leaders to discuss their demands for settlement which pertains to DoT only. BSNL Non Executives and Executives are seriously frustrated and agitated due to non-settlement of their long pending legitimate demands. It is a Do or Die situation - AUAB calls on the employees to organise the 3 day Strike massively : The AUAB held its crucial meeting today. General Secretaries and Senior Leaders of BSNLEU, NFTE, SNEA, AIBSNLEA, AIGETOA, BSNLMS, ATM, TEPU and BSNLOA participated. The meeting reviewed the preparations going on throughout the Country for the 3 day Strike. All General Secretaries gave their reports on the preparations. It is very encouraging to note that excellent preparations are going on. Especially, the momentum has picked up tremendously in the last 2 days. After considering all the factors, the meeting unanimously decided to go ahead with the strike. It starts from midnight today. If any clarification is required, comrades are requested to contact their respective General Secretaries. AUAB holds review meeting - Decides to go ahead with the strike. The 3 day strike, from 18.02.2019. A meeting of the AUAB was held today. General Secretaries and senior office bearers of BSNLEU, NFTE , AIBSNLEA, SNEA, AIGETOA, BSNL MS, ATM, TEPU and BSNL OA participated. The meeting paid homage to the 40 CRPF personnel martyred in terror attack at Pulwama. The preparations that have been made in various circles, to make the strike successful, was reviewed. The meeting expressed it's concern that, the DoT has not even come forward to hold any discussion with the AUAB so far. After detailed review, the meeting unanimously decided to go ahead with the strike. The meeting decided to call upon the circle and district organisations of the constituents, to make the last minute preparations for the success of the strike. The meeting also decided to call upon the employees to hold condolence meetings outside office premises at 10:00 am on 18-02-2019, and pay homage to the 40 CRPF personnel martyred in terror attack at Pulwama. 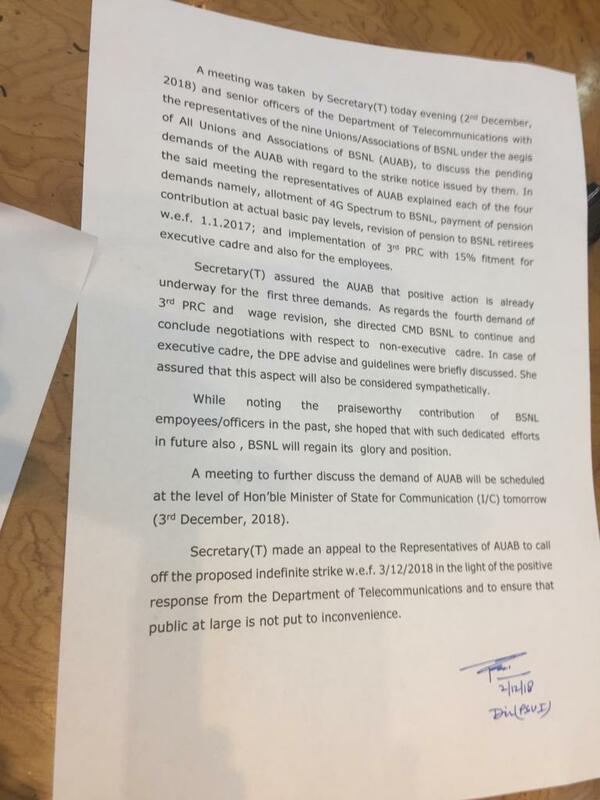 AUAB Meeting with CMD BSNL:AUAB rejects the proposal of the Management for deferring the salary for the month of February, 2019 - AUAB also rejects the appeal of the Management to withdraw the strike. Charter of demands >>>>> 1. Implementation of 3rd Pay Revision with 15% fitment. 2. Allotment of 4G spectrum to BSNL, as per the proposals submitted by the BSNL Management. 3. Implement assurance of the Hon'ble Minister of State for Communications for delinking pension revision from pay revision. Revise pension of BSNL retirees w.e.f. 01.01.2017. 4. Payment of pension contribution by BSNL as per the government rule. 5. Settlement of the left out issues of the 2nd Pay Revision Committee. 6. a) Approval for BSNL's Land Management Policy without any delay. 6. b) Expeditiously complete the mutation and the process of transferring of all assets to BSNL, as per the Cabinet decision taken on the eve of the formation of BSNL. 7. (a) Ensure financial viability of BSNL, as per the decision taken by the Group of Ministers, at the time of formation of BSNL. (b) Issue letter of comfort for BSNL's proposals for taking bank loans. (c) Expeditiously fill up all vacant post of BSNL Board of Directors. 8. Scrap BSNL's outsourcing for the operation and maintenance of it's mobile towers. ��are not implemented by the DoT. The AUAB also told the CMD BSNL that, plenty of time is already given to the DoT, and that the strike will now take place successfully. The AUAB told the Management in categorical term that, there is no question of going back from the decision to go on strike. All the Circle/District Secretaries are requested to make full preparations for the successful implementation of three days strike. AUAB held several round of discussions with DoT officers in the presence of CMD BSNL & Director(HR), BSNL Board but not even a single demand is resolved by DoT. It has forced AUAB to go on three days strike from 18th Feb., 2019 to 20th Feb., 2019. AUAB Meeting with CMD BSNL: CMD has invited AUAB leaders for discussions on 12.02.2019 at 17.00 Hrs. Change of Designation of Draughtsman cadre of Telecom Wing in BSNL---- Guidelines regarding. Appeal for withdrawing Notice for three days strike from 18/02/2019 given by All Unions and Associations of BSNL (AUAB). Approval of renewal of empanelment of hospitals in Amravati SSA. Reply on EPF Pension in Lok Sabha. Co-ordination meeting between BSNL & MTNL. Provisional Answer Key of LICE JTO(T) VY-2016-17. FAQs for implementation of wages to Casual Labour/TSM through ERP in single Company code regime. Exemption of Staff and Vehicles of BSNL from election duty . AUAB meeting with CMD (BSNL): AUAB Leaders met CMD,BSNL in the presence of Director (HR) BSNL Board as per the advice of AST to discuss the viable proposal for pay revision : AUAB leaders demanded 15% fitment benefit for pay revision. Regarding Pension revision less than 15% fitment benefit can not be accepted by AUAB since the pension contribution of the BSNL pensioners was paid BSNL to DOT as per rule. After detailed discussions CMD BSNL mentioned that tomorrow morning 11.00 Hrs; he will be giving a presentation to Secy (T) on revival plan of BSNL including 4G spectrum allocation, monetision of non core land of BSNL, pay revision, payment of pension contribution on actual basic pay and pension revision wherein views of AUAB will also be presented. Detailed discussion took place on the 3rd Pay Revision, 4G spectrum, Payment of Pension Contribution on actual basic pay and Pension Revision issues. As regards the 3rd Pay Revision issue, it was suggested from the DoT side that, Pay Revision with 5% fitment could be given. If the AUAB accepted this, then this issue would be placed for the approval of the Digital Commission meeting, to be held on 05/02/2019, and that thereafter it would go for the approval of the Cabinet, said the DoT side. The AUAB stated that 5% fitment is very low and that they could not accept it. Thereafter, the AST suggested that the AUAB representatives could discuss the issue with the CMD BSNL and could come back to him within a day or two. 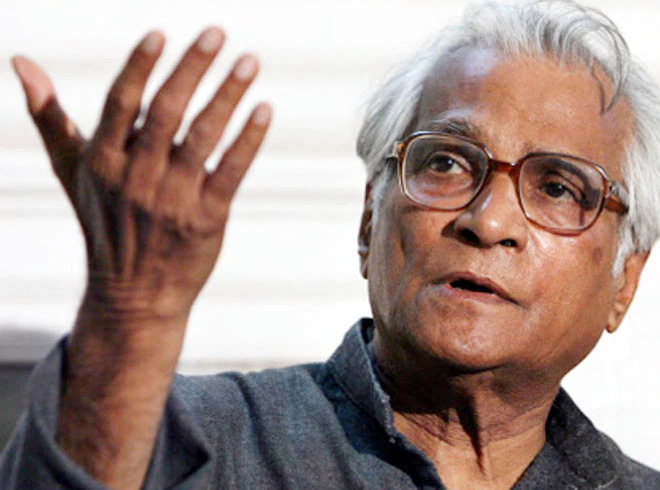 NFTE BSNL Maharashtra Circle expresses, its condolences at the demise of George Fernandes at the age of 88. देशातील कामगार चळवळीचे अध्वर्यू, अघोषित 'बंदसम्राट' व देशाचे माजी संरक्षणमंत्री जॉर्ज फर्नांडिस यांचं आज निधन झाले. ते ८८ वर्षांचे होते. कामगारांचे प्रश्न सामान्य मुंबईकरांपर्यंत आणि सरकारपर्यंत पोहोचवले. George Mathew Fernandes: In 1949, he joined the socialist trade union movement In Mumbai. 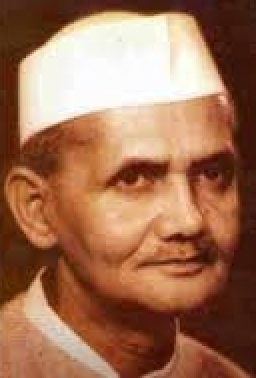 Becoming a trade union leader, Fernandes organised many strikes and bandhs in Bombay in the 1950s and 1960s while working with the Indian Railways. He organised the 1974 Railway strike, when he was President of the All India Railwaymen's Federation. He was among the most effective voices for the rights of the poor, marginalized and workers. Selection for the post of CMD BSNL: PESB in its meeting held at 10.00 AM on 29.01.2019 [Today] recommended the name of Sh. Pravin Kumar Purwar, CMD MTNL for the post of CMD BSNL. Corporate office issued letter regarding Information of casual labourers who had been conferred Temporary Status on or before 30-09-2000 . (3) Revision of pension to BSNL retirees w.e.f. 01.01.2017. (6) a) Approval for BSNL�s Land Management Policy without any delay. (7) Extend financial support to BSNL, to ensure financial viability, as per the decision taken by the Group of Ministers, at the time of formation of BSNL. Issue letter of comfort for BSNL�s proposals for taking bank loans. (8) Scrap the proposal for outsourcing for the maintenance of BSNL�s mobile towers. letter regarding Launch of New Plans/Offers by CFA wing of BSNL. Non payment of Cash in liew of Towel,soap. HR integration of Finance wing of BSNL Co, New Dethi with personnel wing. 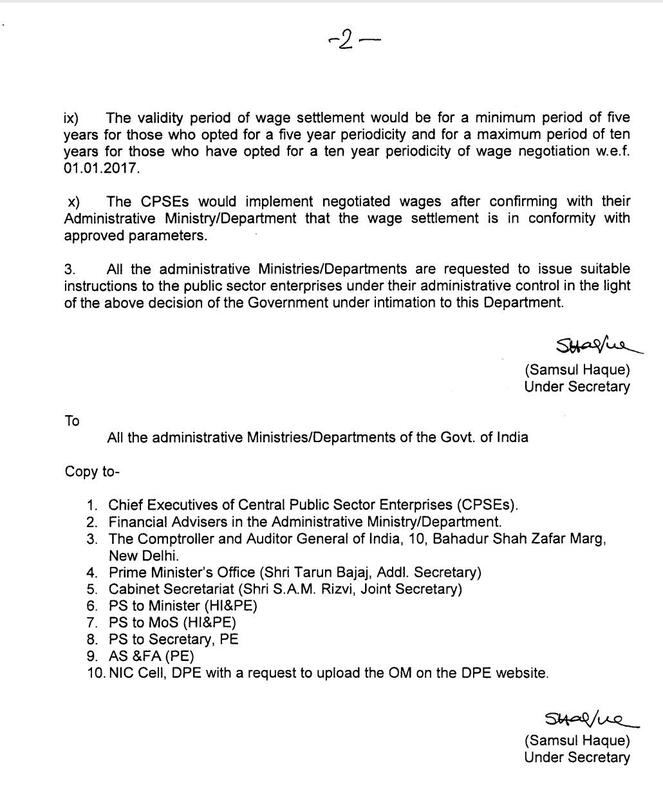 WAGE REVISION- seeking one time exemption to BSNL. Extension of Empanelment of Hospital in Mumbai area. LICE for promotion of internal candidates - providing computer training. Min of Personnal, Public grievances and Pensions order for Reservation in Economically weaker section w.e.f 01.02.2019. Reservation in Economically weaker section in Govt services. Calling options for posting in various SSAs including tenure SSAs (for the period upto September 2019) in the grade of Junior Engineer (Telecom). Press: BSNL Launches Wings VoIP App on Play Store, Allows Subscribers to Make Calls Over Internet. Correction of Vacancy Year in Hall Ticket of LICE for promotion of Group C employees to JTO(T) under 50% quota for VY 2016-17. Press:BSNL Launches Bharat Fiber High-Speed FTTH Broadband Services. Press:BSNL Data Only Prepaid Plan of Rs 98 Offers 1.5GB Daily Data for 26 Days. 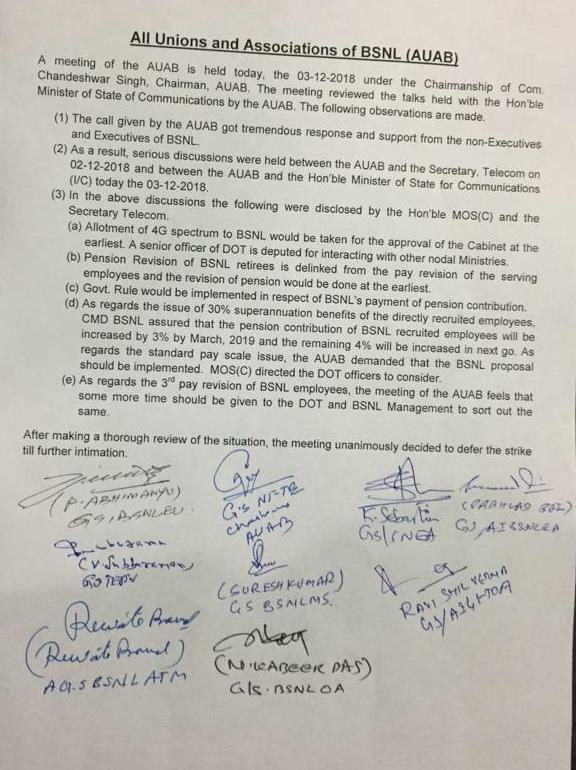 In the meeting held on 10.01.2019, the Additional Secretary, Telecom, directed the AUAB to hold a discussion with the BSNL Management on the 3rd Pay Revision issue, and to come back to him for a meeting in the following week. Accordingly, a meeting took place between the AUAB and the CMD BSNL today. The Director (HR) was also present in the meeting. Discussion took place on the issue of 3rd Pay Revision. The AUAB representatives categorically demanded that 3rd Pay Revision should be settled with 15% fitment. The CMD BSNL also stated that the BSNL Management sticks on to its earlier position that 3rd Pay Revision should be settled with 15% fitment. The AUAB pointed out that the notification for Parliament election would be issued any time in the month of March, and that the available time for the settlement of 3rd Pay Revision was very less. The representatives also pointed out that the AUAB would be constrained to restart the agitation, if no favourable settlement comes on time. AUAB reminded about the issuing the minutes of the meeting with CMD in which 3% hike in Superannuation benefits assured, which DIR(HR) agreed to issue immediately. LICE for promotion of Internal candidates to various cadres- regarding providing computer based online examination training to Gr. C & Gr. D candidates. Post Launch Activities for SAMPANN. Instructions regarding CGHS Beneficiaries Prescription Slip by CGHS Additional Director. 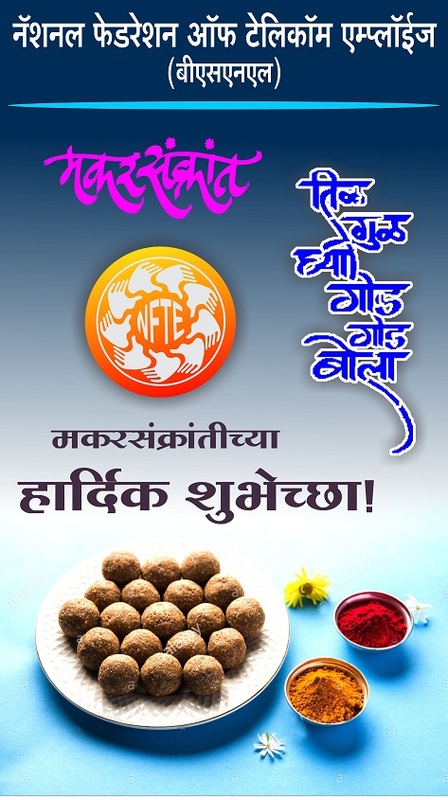 Wish you all a very Happy Prosperous Lohari, Makar Sankranti and Pongal. 3rd Pay Revision : Detailed discussion took place. The Addl. Secretary(T) told that the DoT is ready to settle the 3rd Pay Revision. But, he categorically told that it will be very difficult for the DoT to get the approval of the Cabinet for 15% fitment, since BSNL�s financial position does not allow payment of such high salary. He requested the AUAB and the BSNL Management to discuss and take viable decision and bring to DoT immediately so that this can be taken in next Digital Commission scheduled to be held in the first week of Feb., 2019. 4G spectrum to BSNL: As regards the allotment of 4G spectrum to BSNL, the Addl. Secretary(T) confidently told that the DoT would do it�s best to get the Cabinet approval for the allotment of 4G spectrum to BSNL. He expressed hope that the Digital Commission meeting to be held in the 1st week of February would give the necessary clearance, after which it would go for the Cabinet approval. Payment of Pension Contribution on actual basic pay: As regards the issue of Payment of Pension Contribution on actual basic pay, the Addl. Secretary(T) told that the Department of Expenditure (DoE) has sought certain details and that the DoT has already written to the BSNL in this regard. The Director (HR) replied that within 1 or 2 days, BSNL would send a reply to the DoT. The Addl. Secretary(T) assured that thereafter prompt action would be taken to get the approval of the DoE. Pension Revision: On this issue, the AUAB representatives expressed their dissatisfaction and demanded that prompt action should be taken by the DoT. Thereafter, detailed discussion took place with regards to the fitment, etc. Finally, the Addl. Secretary(T) requested Director(HR) to provide with copies of relevant documents like Govt. orders related to the earlier pension revision documents to the employees, etc. Left out items of 2nd PRC :At the end of the meeting, the Addl. Secretary(T), DoT suggested that the AUAB representatives could again meet him next week. In addition to that left out items of 2nd PRC, Director(HR) BSNL informed that the BSNL Management is taking necessary action to enhance the superannuation benefits from 5% to 8%. Interim Report by IIM Ahmedabad on Revivial/Restructuring of BSNL. 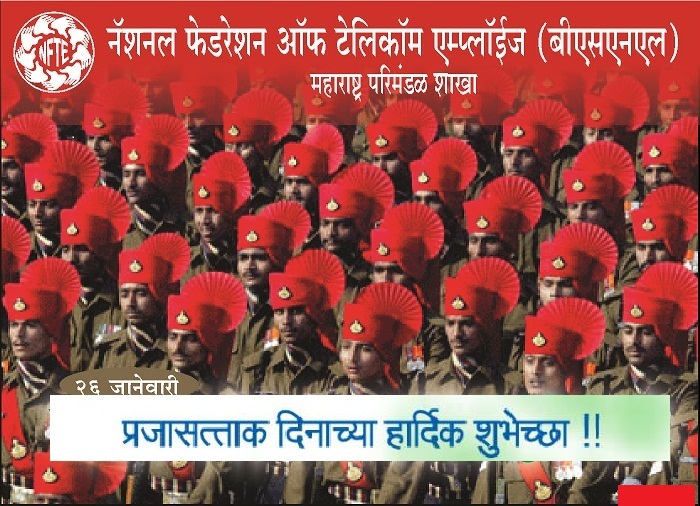 Congratulations and Sincere Thanks: Two day General strike completed successfully in all SSA�s in Maharashtra Circle. 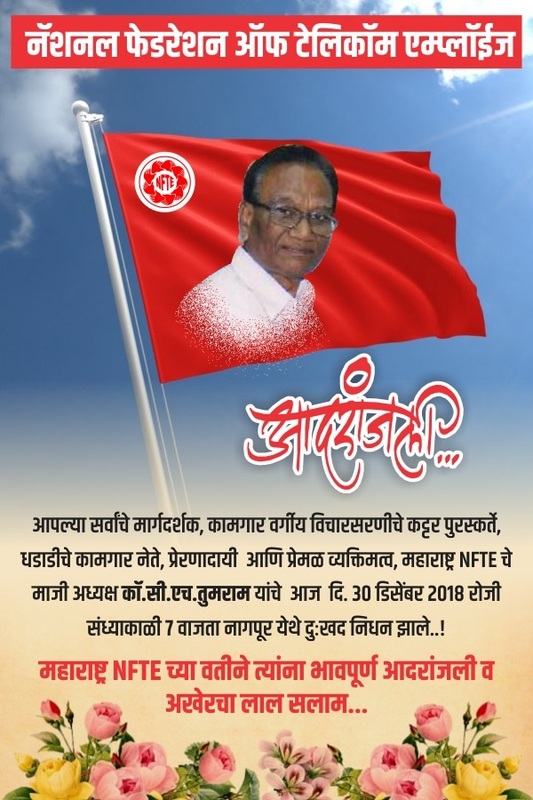 NFTE Maharashtra congratulates All members, district secretaries, circle office bearers , district office bearers, branch secretaries and Non Executives who participated in the strike. LICE for promotion to Junior Engineer (JE) under 50% quota for RY 2017. DOT's letter (action taken report) regarding December 2018 strike notice issued by AUAB. Circle Office letter to SSA regarding Holding of Local Council and Works Committee meeting. Com. O.P. Gupta unparallel leader of working class and founder of UPTW and NFPTE. Press News :Niti Aayog�s View regarding Rs 14,000 cr infusion in BSNL,MTNL for 4G service. Compliance of Minimum Wages payable to Casual Laborers working in BSNL. IDA from 01.01.2019 : The IDA increase with effect from January 2019 will be 3.2%. Total IDA from January 2019 will be 138.8%. Q and A regarding Performance of BSNL and MTNL in Lok Sabha. BSNL to raise Rs 12,000 crore from PSBs for network upkeep. Screening Test for TOA (G)/TOA (TG)/TOA (P)/TOA (T) for promotion to the cadre of Sr. TOA (G) held on 16.12.2018 (Sunday) in Maharashtra Telecom Circle - Provisional Answer Key. Minutes of 4th CCM meeting (2016-19) with recognised unions held on 13/11/2018. Extension of CGHS facility to retired employees. 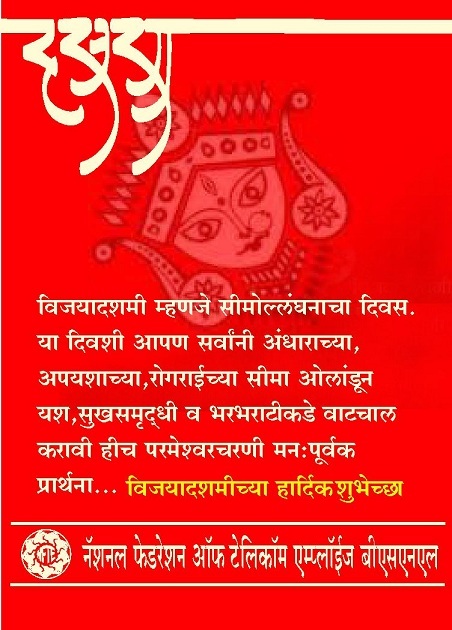 List of Closed Holidays/Restricted Holidays to be observed by the Administrative/Operative Offices of Maharashtra Telecom Circle during the year 2019. Restructuring and re-distribution of Hindi Cadre Posts in BSNL. Revision of Pension of BSNL's Pensioners: DDG(Estt.) 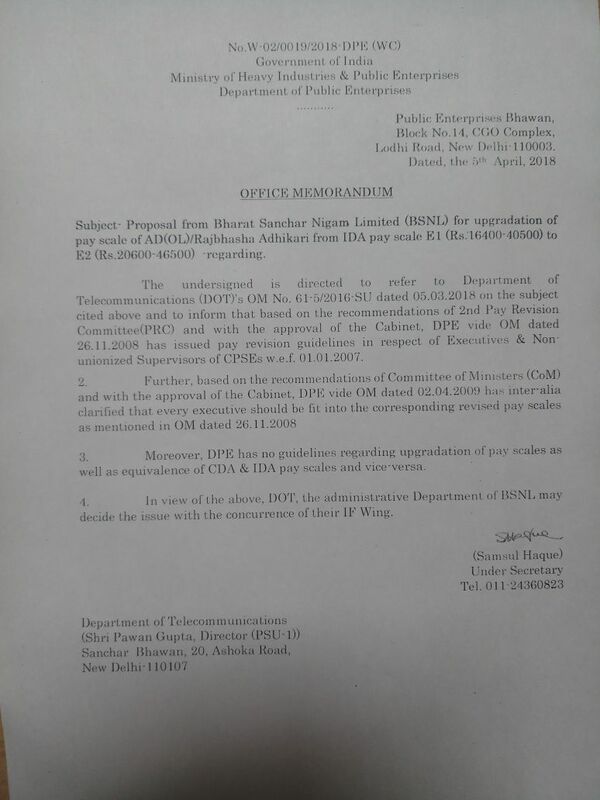 DoT confirmed that a proposal for delinking of pension revision of BSNL Pensioners from the pay revision of BSNL employees has been sent to DoP&PW for comments/Policy. He advised to pursue in DoP&PW for early reply to DoT. 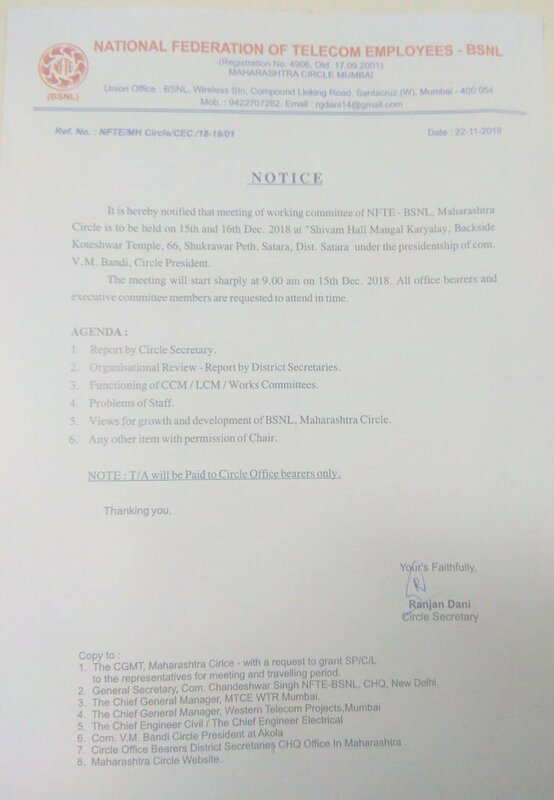 Notice for CEC of Maharashtra Circle Branch. The AUAB decides to defer the strike for one week. Secy(T), DoT Meeting with AUAB held today : Talks between the AUAB and the Secretary (T), DoT were held today the 02nd Dec., 2018. Improvements are there in the issues of 4G Spectrum, Pension Revision and pension contribution. 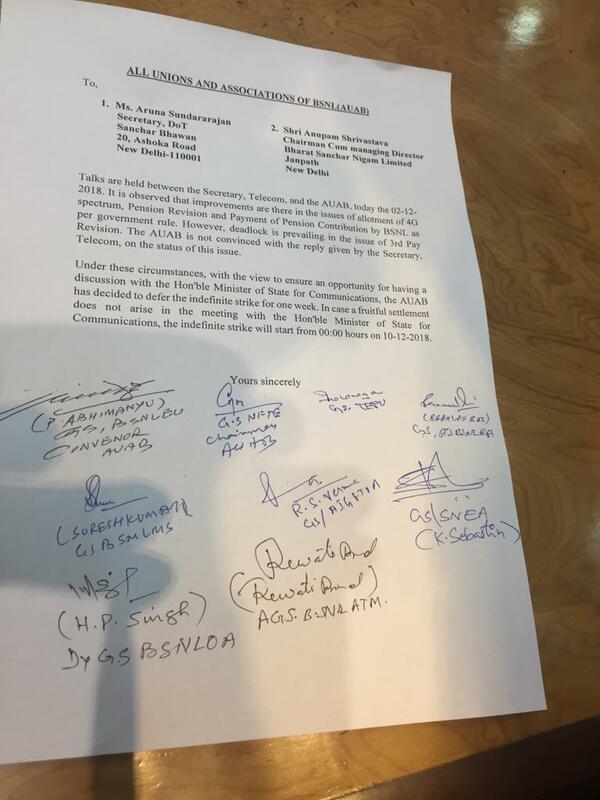 However, dead lock in prevailing in the issue of 3rd Pay Revision. With a view to ensure discussion with the Hon'ble MOS(C) on this issue, the AUAB decides to defer the strike for one week. If fruitful outcome does not come in the meeting with the Hon'ble MOS(C), the strike will start from 00.00 Hrs. on 10thDec., 2018. FLASH NEWS: 02.12.2018 15 00 hrs: Additional Secretary (Telecom) invited AUAB for talks at 15 30 hrs. today. Today, A/N 12.00 Hrs. CMD BSNL called all the General Secretaries for Discussion on the AUAB demands and ongoing Agitation. CMD BSNL and Director(HR) further apprised the representatives regarding the developments taking place in DoT with respect to the demands AUAB and Indefinite Strike with effect from 3rd December 2018. CMD appealed that since the DoT Administration is now taking steps for the settlement of some of the demands, AUAB should withdraw the agitation. After detailed discussions AUAB Leaders expressed their serious concern against not honouring the Commitments given by the Hon'ble MOSC (I/C) to AUAB Leaders in the meeting held on 24.02.2018, after a lapse of 9 months and the Secretary (T) meeting held on 2.11.2018. AUAB Leaders categorically told the CMD, if the competent authority should give written assurance for the settlement of demands in bound manner, thereafter only AUAB can review its decision. 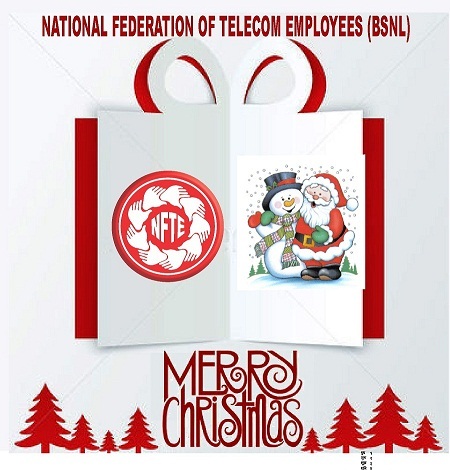 Revolutionary greetings on NFPTE/NFTE Day, 24th November. Absorption in BSNL and issue of Presidential Order of left out cases . Additional iformation regarding consideration of Temporary Status Mazdoos (TSMs) regularized on or after 01/0/2000 and absorbed in BSNL w.e.f. 0/0/2000 and covered under Rules 27- of CCS (Pension) ruling. Notice for the indefinite strike, w.e.f 03-12-2018. Rally conducted by AUAB on 14-11-2018. Photos. Circular of AUAB,which contains details of the proceedings and decisions of the AUAB meeting held today.Click here. Guidelines for forwarding of applications of BSNL employees for outside direct recruitment employment. Inauguration of alternate digital KYC process by BSNL. Departmental Examination Calendar for year 2018-19. LICE regarding Computer based exmaniation. Action taken report of 3rd CCM meeting items. Information regarding Data profiling of Casual Laboures/Temporary status Mazdoors working in field units of BSNL. Establishment Review for calculating vacancies under CGA for the 2017-18. Holding of LICE of JTO Under 50% quota. All SSA Heads Sub: Utilisation of Welfare Fund Grant. CCM Agenda Point: Instruction by Circle Office regarding Carrying of Identity Cards by the employees of the Agency / Contractor. Press release of All Unions and Associations. Rule 37 A of CCS (pension) rule 1972. Action on CCM Agenda Item :1) Issue of new ID card and BSNL MRS card on expiry of validity period. 2) Preventive Health Checkup Scheme. Payment of Dearness allowance (DA) to Casual Laboures ( including TSMs) to draw their wages in terms of letter no.269-11/2009-Pers-IV?LE dated 01.01.2010. Instructions regarding reimbursement of OPD Medical Bills. Limited Customer Service Facility for pensioner�s Counter proposed through Comprehensive Pension Management System (CPMS) Portal. Clarification on reimbursement of expenditure incurred on daycare procedures . SSA Heads Buldhana, Dhule, Jalna, Kalyan, Ratnagiri, Sangli, Satara& Yavatmal Sub:Poor performance in settlement of grievances of retired employees and no response to grievance. Non implementation of Assurances, Letter to Management by All Unions and Associations. Compassionate Ground Appointment- reg. married Son. Waiver of outdoor treatment limit for chronic disease. Absorption in BSNL and issue of Presidential order of left out cases. Message from Director (HR) BSNL Corporate Office, New Delhi. Maharashtra Circle Staff Welfare Board and Maharashtra Circle Sports & Cultural BOARD Meeting for the year 2017-18. BSNL is in Talks With Netflix for a Potential Tie-Up. IDA increase. IDA will increase from 128% to 135.6%, w.e.f.1st October 2018. Thus, the net increase in IDA will be 7.6%. Holding of Local Council and Works Committee meeting. 50th anniversary of the glorious one day strike of 19th September, 1968. The fruits being enjoyed by the Central Government employees today, are the results of the sacrifices made by the employees and leaders who participated in the glorious one day strike of 19th September, 1968. NFTE BSNL Maharashtra Circle pays it�s respectful homage to the martyrs of the 1968 strike, and salutes the entire workers. Non-payment of stipend of two days, i.e, 29.08.2014 & 30.08.2014, to DR JEs. BSNL Data Plans 2018 : 3G 4G Mobile Festive Tohfa Introduced. BSNL 4G Services Expected to Launch Soon as DoT Grants Permission to Acquire Airwaves. Preparation and Submission of items of Agenda for Council meetings. Clarification on Compassionate Ground Appointment in r/o/ rejected cases. Photos of District Conference of PUNE Telecom. District Conference of PUNE Telecom District: - The District conference of Pune was held in impressive way under the Presidentship of Com.Mrs.S.M. Pardeshi on 7th September 2018 at MHS (Carrier building) recreation hall. The conference started at 11.00 am. with Flag Hoisting and lighting of lamp and paying tribute to Com. Om Prakash Gupta and Com.M.B.Vichare by garlanding their photos. 120 delegates participated enthusiastically in the conference . Com.Ranjan Dani Circle Secretary and Com. K.S.Kulkarni addressed the gathering on current issues, wage revision to non-executives, financial condition of BSNL, revival of BSNL, PLI, and government's anti CPSU, Anti labour policies, circle issues, also spoke on NFTE BSNL achievement after recognition and also appealed to workers to work sincerely to put BSNL on progressive path. Com. Dilip Jagdale Permanent Invitee CHQ, Senior Com. S.N.Shinde, Com.Mrs. Rohini Ghadge, Com. Rasal, Com.Pravin Kakade ACS, Com. Vishnu Dhoble Adv. also addressed the house. Com. Mrs.S.M.Pardeshi ,Com. Dilip Jagdale and Com.Dilawar Shaikh were elected unanimously as President, District Secretary and Treasurer respectively. Anchoring of the meeting was done by Com. Saraf District Treasurer in well disciplined manner. Maharashtra Circle congratulate Newly elected District body.(Photos). BSNL Revises 7 Prepaid Data STVs Priced Under Rs 100: Check Full Details. Change of Designation No.2-4/-Restg.Vol-III(Pt) Dated 06.09.2018. Minutes of staff welfare meeting held at CO New Delhi. Absorption in BSNL and issue of Presidential Order of left out cases: submission of the cases by Circles in proper format. BSNL Now Tries to Match Jio With its Rs 75 Prepaid Plan Offering Data, Calling Benefits for 15 Days. FAQ on Retention of Quarters beyond the permissible limits. Periodical Review for ensuing probity and efficacy among employees. BSNL Overhauls Entire Broadband Tariff Portfolio to Compete With Airtel V-Fiber. Press News: BSNL IDA Rates October 2018 Records Outmost Increase. BSNL Makes a Revision to Four FTTH Plans; High-End Broadband Plan Now Offers 3.5TB FUP. Rajya Sabha PQ No.583, regarding contractors involved in supplying labour to BSNL. One day voluntary contribution of one day Basic Pay by BSNL employees towards Prime Minister 's Relief fund for the Victims of flood in Kerala State. Broadband: BSNL Increases FUP Limit on Rs 249 Plan by 3 Times. BSNL Offers : Broadband Plan FUP Limits Increased Above 100%. BSNL Starts Offering Additional 2GB Daily Data on Popular Prepaid Plans for a Limited Period. BSNL Launches Rakshabandhan Special Prepaid Plan of Rs 399 Offering Unlimited Data and Calling for 74 Days. Review of mechanism to ensure probity among Government servants. BSNL Offering Unlimited Calling On Wings Internet Telephony App for One Year at Rs 1,099. BSNL Increases FUP Limit on Rs 699 Broadband Plan by More Than 500%. Clarification on individual cases related to service matters received from Unions/Associations. Holding of LICE for Junior Engineer under 50% quota for the recruitment year-2017. Poor performance in settlement of grievances of retired employees and no response to grievance referred. BSNL Lends a Helping Hand In Kerala Flood Crisis, Offers Unlimited Calls on Its Network for 7 Days. BSNL Offers 14GB Data and Unlimited Voice for 7 Days at Half the Price of Other Telcos. On behalf of NFTE BSNL Maharashtra circle we pay our respectful homage to the former Prime Minister of India Atal Bihari Vajpayee who breathed his last on 16-08-2018.We deeply mourn his death and offer sincere condolences to his relatives and friends. 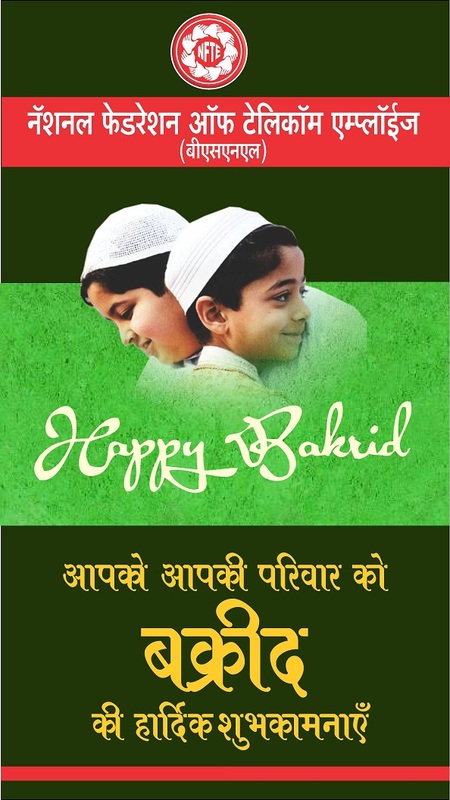 The Bakrid holiday is changed to 23-08-2018_Order issued by Dept of Personnel and Training. BSNL Data Postpaid Add-On Plan Packaging 30GB Data at Rs 1711. BSNL Wings Registration With New Plan & Service App Download. Clarification regarding CGHS beneficiaries by Ministry of Health. Absorption in BSNL and issue of Presidential Order of left out cases : submission of the cases by Circles in proper format. BSNL Offers : Mobile and Broadband Latest Promotional Schemes. NFTE BSNL Maharashtra Circle Condole the demise of Dr.Kalaignar Karunanidhi and pays respectful homage to the departed leader. BSNL Makes Major Change to SMS Benefits of Postpaid Plans. Application of GST while enforcement of Bond Agreement in respect of DR-JEs/JTO----Guidelines. BSNL Urges DoT to Release Rs 250 Crore Worth of Funds for Network Expansion in LWE Affected Areas. 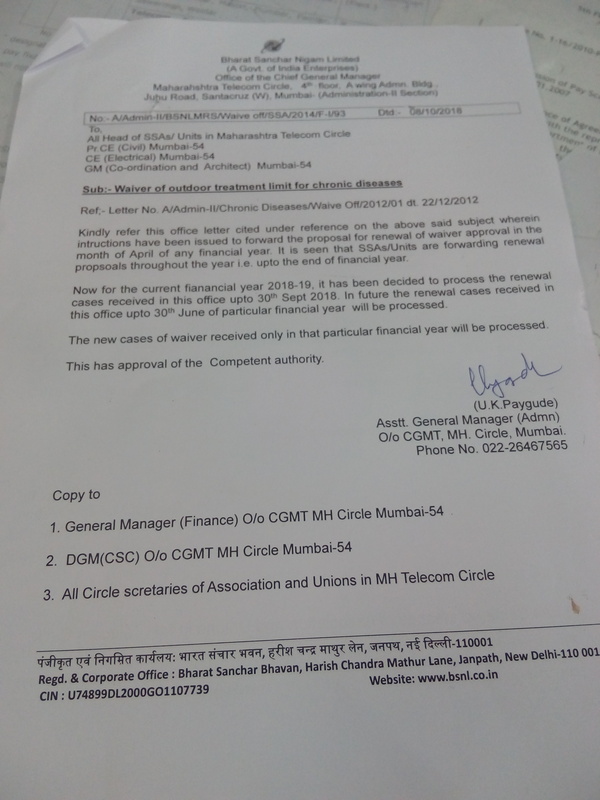 Clarification regarding CGA by Corporate office to Maharashtra Circle. Presidential Order left out cases. Compassionate Ground Appointment (CGA) - Issue of speaking order/obtaining of acknowledgement iro of CGA cases regarding. Holidays to be observed in BSNL offices during the year 2019. Message from Director (HR) , BSNL , Corporate Office , New Delhi. Pension Sanction Authority for IDA pensioners and custody of Service Books of IDA Pensioners. Service verification of service books of officers/officials who have completed 18 years or have 5 years of service before retirement. LIST OF EMPANELLED HOSPITAL IN MUMBAI AREA. Medical facility from Apollo Pharmacy on Discount basis. IDA July 2018 BSNL's order. Press BSNL Makes Voice Calling Affordable for Prepaid Users With the All-New STV 19. PressBSNL WiFi Broadband Plans is Cheaper & Faster for Wireless Internet. Appointment of Director(Estt) in Maharashtra Circle for issuing of Presidential Orders of Group B,C and D employees. Payment of Gratuity to the employees of CPSEs Clarification. Settlement of outdoor medical claims of Allopathy Medicines prescribed by Homeopathy / Ayurvedic doctors under BSNLMRS . Press BSNL Increases FUP Limit on Three FTTH Broadband Plans by 50GB. Demonstrations in front of BSNL Circle office/CCA office at Circle and at SSA level on 11.7.2018. Medical facility from Apollo Hospital on discount basis. Press BSNL Rs 249 Entry-Level Broadband Plans Gets Validity Extension Again: 5 Things to Know. Press BSNL Balance Check For Prepaid on New Codes Display Net Balance, Offers. PressBSNL Announces Most Economic Broadband Plan With 600GB Monthly Data at Rs 491. PressBSNL to Facilitate Internet Calling via Wings App, Registration Starting on August 1. PressBSNL Balance Check For Prepaid on New Codes Display Net Balance, Offers. Release of pensionary benefits to a retiree against whom personal court cases (other than departmental) is pending in the competent court. Immunity from transfer clarification from corporate office. Deduction of Revised Union Subscription. Kind attn: all SSA Heads Sub: Maharashtra Circle Welfare /Sports and Cultural Board for Annual General Body Meeting of the year 2018-19. Press2018 New BSNL Data Plans For Mobile Offers Unlimited 3G/4G Internet. PressBSNL Requests Trai to Default e-Bill Method for Postpaid Customers. BSNL Introduces Unlimited Data for Postpaid Plans With 40 Kbps Post FUP Speed. IDA increase w.e.f. July 2018 : The increase in IDA from 1.7.2018 will be 0.8% taking the total IDA payable to 128%. Press BSNL Starts Offering Unlimited Data With its Postpaid Plans. Select New BSNL Prepaid Recharge Plans 4G For Unlimited Voice Data. Clarification regarding Child care leave. Maintaining of Service Book, Issuance of MRS Card at the time of provisional appointment in respect of Direct Recruit JTOs/JEs/Compassionate Ground Appointees etc. 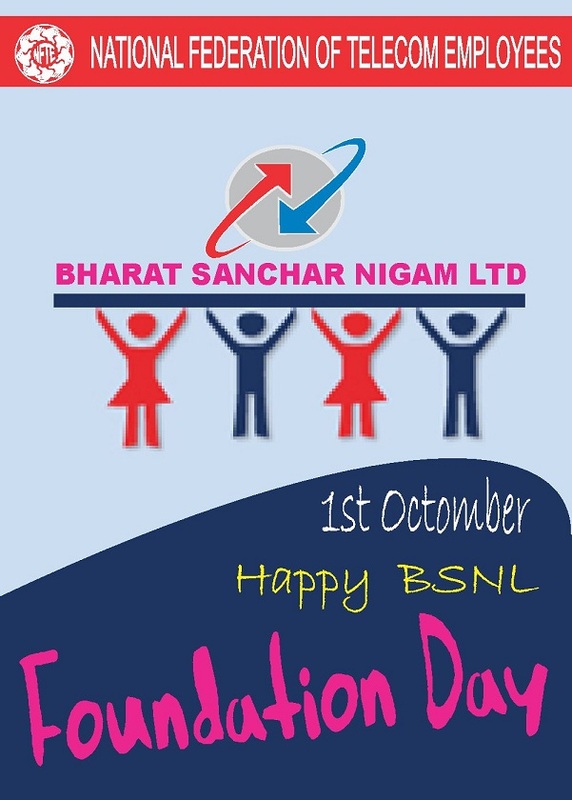 in BSNL. Press BSNL to Provide Up to 100 Mbps Broadband Connectivity Using Satellite Technology. Updation / Attestation of Service Book. Press BSNL Starts Offering 20 Mbps Free Broadband Connection to New Laptop Buyers. PressBSNL FIFA Season STV Plan Offers 112GB Data for 28 Days Under Rs 150. PressBSNL Opts for Legal Pathway In Order to Recover Rs 42 Crore from Aircel. PressBSNL Monsoon Offer : Upto 200% Extra Data on Prepaid Plans. PressBSNL to Launch 5G Services Internationally in Partnership. PressiPass Partners BSNL To Provide Ultra Speed WiFi Hotspots. Utilization of OLA vehicle Services in BSNL Maharashtra Circle. BSNL Ups the Ante by Offering Additional 2GB Daily Data With its Prepaid Combo Plans. Verification of service of BSNL absorbed employees and DOT employees after completion of 18 years of service or on being left with five years service. Holding of LICE for LDC to UDC in corporate Office. Responsibility of the principal employer to provide social security benefits in respect of outsourced employees engaged through Contractors. Promotional Data STV-149 for FIFA World Cup under GSM Prepaid Mobile Services. Link for online Form for retired employees grevences. Online Form for redressal of grievances of retired employee of BSNL. Press:BSNL Landline Users Can Enjoy Unlimited Voice Calls at Rs 99 Per Month. Comrade G.L.Dhar A great leader of former CG Movement passed away. Com. G.L. Dhar, Secretary AITUC, former Secretary General Central Secretariat employees and popular veteran trade union leader of CG employees movement has breathed his last. This leader ( 92 years old) was very popular in Delhi and had conducted historical struggles for the cause of working class. 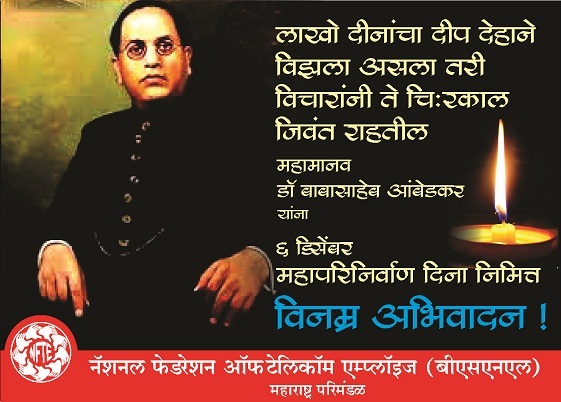 NFTE BSNL Maharashtra Circle dips banner in honor and memory of this departed leader. Submission of details of officials/officers who are absconding/absent as unauthorised from duty. Information regarding GPF. Letter from C.O.New Delhi. Declaration of the All India Convention of the Central Public workers. Maharashtra Circle Welfare and Sports & Cultural Board Annual General Meeting for the year 2018-19. PressBSNL Announces True Unlimited Voice Calling on a Slew of Broadband Plans. Terms & Conditions of Group'B' (Non-Gazetted)/Group'C' staff of BSNL working on deputation in DOT. : BSNL/Admn/StaffQtrs(Retn)/31.-2/2015(pt)/18 Dated:25.05.2018. CLOSING OF GOVT. OFFICES IN CONNECTION WITH ELECTION . Service particulars of employees who have completed 18 years, or left with 5 years of service, are to be verified. Government looking at stake sales in 11 more public sector companies. REVISED AND UPDATED EMPANELED HOSPITAL IN MUMBAI AREA - REG. CHQ NEWS:AUAB defers the call for walk-out and conducting rallies on 28.05.2018, against Subsidiary Tower Company: Based on the notice issued today, by the All Unions and Associations of BSNL, for organising walk-out and rallies on 28-05-2018, the CMD BSNL invited the leaders of the AUAB for talks. The talks started at 16:30 hrs. and lasted for almost two hours. 1) To hold massive rally and protest demonstration at Hyderabad on 28.05.2018, against the Subsidiary Tower Company. All the General Secretaries of the Unions and Associations of BSNL will go to Hyderabad and will lead this rally / protest demonstration. 2)The entire Non-Executives & Executives of BSNL should walk out of their offices / work places throughout the country on 28-05-2018 and should organise rallies against the Subsidiary Tower Company. Regular updation of service details in the Service books of IDA Pensioners. Ltr. No.40-06//2015-Pen(B) dtd.22.05.2018. Grievance redressal cell for the Retired Employees. Ltr.No.BSNL/20-9/SR/2018 Dtd.22.05.2018. PressBSNL Countering the Postpaid Competition With the New 45GB Monthly Data Plan. Action taken report of committee constituted for improvement of Inspection Quarters. PLI Joint Committee Meeting:- Meeting held under chairmanship of Shri. 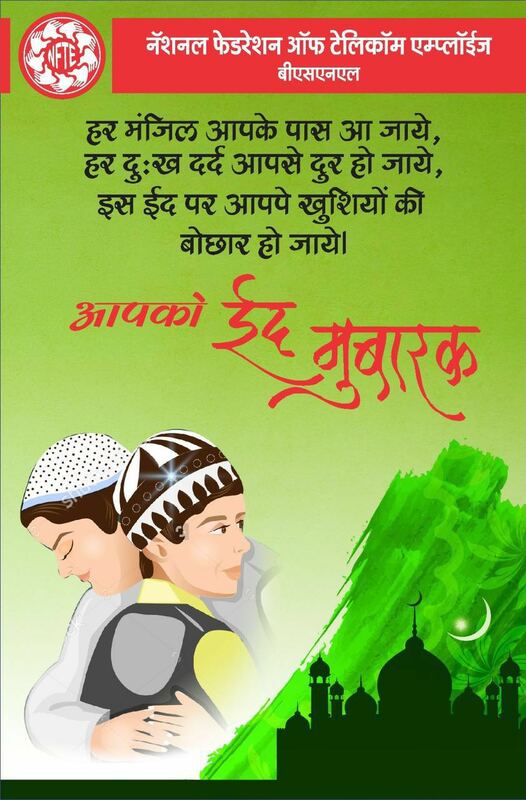 Ashutosh Gupta G.M. (Restg),GM (SR), Sr.GM(Estt), GM(Rectt) GM(EF) were present from Management side, NFTE was represented by G.S. and Com. 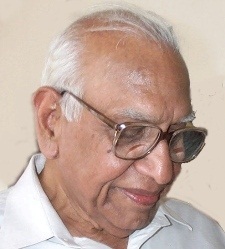 K.S.Kulkarni. A detail discussion held for payment of adhoc PLI the F/Y 2015-16. In the meeting Management side supplied the data related to Staff strength, Service Connections in r/o Land line,Broad Band, FTTH, Mobile and leased line and also reported income and loss for the respective year but increase in service revenue was not given in the statement, hence it is decided to hold another meeting for which date will be fixed later with consultation with staff side. Terms & conditions of Group "B" (Non-Gazetted)/Group "C" staff of working on deputation in DOT - Regarding. Payment of Dearness allowance(DA) to Casual Labourers [ including TSMs] to draw their wages in terms of letter No.269-11/2009-Pers-IV/LE dated 01.01.2010.
Review of policy of Concessional telephone facilities for retired employees of DOT and extension of the same to pensioners of erstwhile P&T Department. PressBSNL Gearing Up for 4G Launch, Introduces 4G USIM at Rs 20.
Review of the Recruitment Rules / Service Rules (RRs / SRs) � DOPT Instruction . Week-long campaign from 7th to 11th May, 2018 - Organise street corner meetings, against the anti-BSNL policies of the government and demanding the rolling back of the Subsidiary Tower Company . PressBSNL Counters Rival Players By Extending Sunday Free Voice Calling Offer. PressDoT Furnishes New Draft of Altered Telecom Policy for Public Consultation. PressBSNL Prepaid STV 349 Now Offering 54GB of Data and Unlimited Voice for 54 Days. Review of pending cases of absorption of Group B, C and D employees in BSNL. PressTelecom Commission Gives Green Flag to In-Flight Mobile Connectivity in India. Extension of without voucher facility to retired employees. 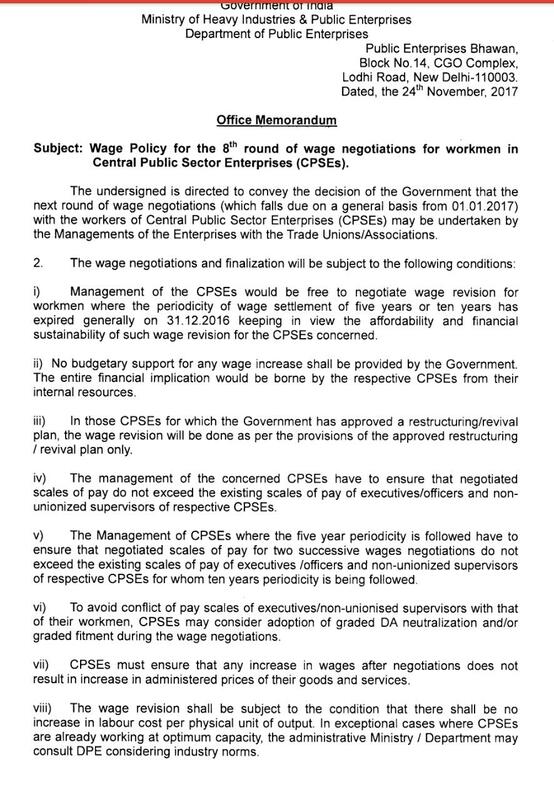 (3) On the issue of wage revision, it is noted that the DPE has replied to the DoT, stating that the pay revision issue could be taken for the approval of the Cabinet. In this regard it is decided that, immediate meetings should be sought with the Hon�ble Minister of State for Communications and the Secretary, DoT, to discuss the issues of wage revision, pension revision and pension contribution. (4) As regards holding a National Convention against formation of the Subsidiary Tower Company, the last meeting decided that the same could be held on 09th or 10th May, 2018. The issue was discussed in today�s meeting. In view of the campaign programme to be conducted against formation of Subsidiary Tower Company from 07th to 11th May, 2018, it is decided to defer the date of this Convention. BSNL endorses DPE orders for payment of IDA at revised rates from 01.04.2018. Implementation of recommendations of 7th CPC pay revision in respect of employees working in BSNL on CDA Pay Scales. DPE's letter to DOT regarding Wage Revision. Memorandum to be submitted to the Governor of State. Business Area Heads of Chandrapur,Jalgaon,Solapur. Exclusive contest for BSNL employees and their family members by CELLTICK . Discount scheme for BSNL Employees subscribing to Online Education Service by Extra marks. Media News:Get BSNL Social Media Discount Offer On Booking Your New Service. Payment of Dearness allowance(DA) to Casual Labourers ( Including TSMs ) to draw their wages in terms of letter no.269-11/2009-Pers-IV/LE dated 01.01.2010. Call for choice of events to conduct Maharashtra circle selection Trial Tournament for the year 2018-19. Wishes you all very happy Vaisakhi/Vishu/Mesadi on 14-04-2018 and Vaisakhadi(Bengal)/Bahag Bihu(ASSAM) on 15-04-2018. 127th Birth Anniversary of Bharat Ratna Babasaheb Dr. Bhim Rao Ambedkar. Corporate Office letter on payment of Dearness Allowance (DA) to Casual Labourers. Media News:Latest BSNL 4G SIM (USIM) Introduced in Market at Cheapest Price. Declaration of Holiday on 14-04-18 - Birth day of Dr B R Ambedkar. �Dharna� on 12 04 2018 demanding the rolling back of the subsidiary tower company. Details of Accommodations being occupied by Unions / Associations. Confirmation of GPF Balances upto March'18. Age profile of the Non-executives. Media News:BSNL Best Offer That You Should Know Before Mobile Recharge. All District Secretaries are requested to start preparations to make �Dharna� programme a big success on 12-04-2018, demanding to roll back the Subsidiary Tower Company. Kindly co-ordinate with all unions/associations for success of Dharna. i)To conduct a nationwide campaign programme in all the Public Sector undertakings. ii)To send Fax to the Prime Minister and Minister of Heavy Industries. iii)To conduct a National Convention on 25th May, at New Delhi, against privatisation, Fixed Term Employment and on wage revision issue. 96th Birthday of Late Com. O. P.Gupta. Circle Office guidelines regarding maximum use of Online Facilities by EPF Members provided by EPF Department. Confirmation in the Cadre of TOA(G)/TOA(TG)-----furnishing information. Media Reports:BSNL�s Rs 1125 Postpaid Plan Offers 90GB of Data, Unlimited Calling Same as Airtel and Vodafone. Media Reports:BSNL launches IPL prepaid pack. Declaration of Holiday on 14th April, 2018 � Birthday of Dr. B.R. Ambedkar. DOPT Letter No.-12/6/2016-JCA-2, dt-02-04-2018. Deployment of manpower through DGR,EOI. Matter regarding engaging Security Guards. The Terms & Conditions of Group "B" (Non-Gazetted)/ Group "C" staff of BSNL working on deputation in Department of Telecommunications. 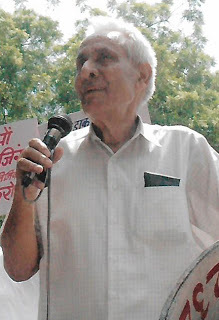 Veteran socialist leader & champion of working class & downtrodden Bhai Vaidya is no more..! 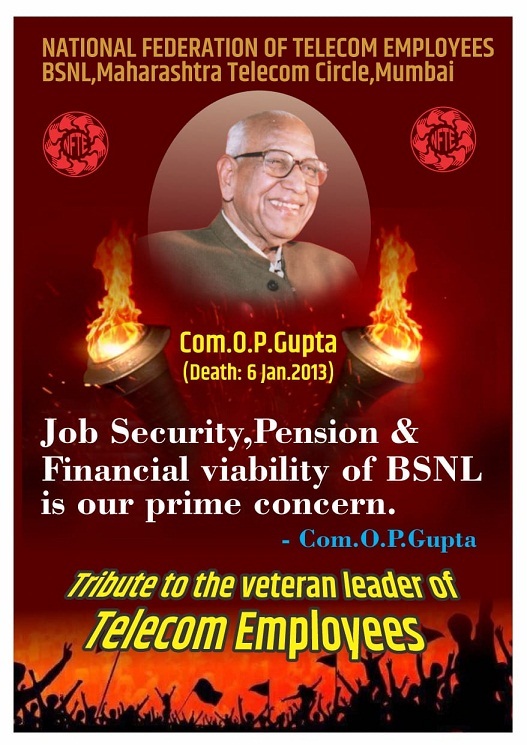 NFTE BSNL Maharashtra Circle, pays respectful homage to the departed leader..!! Com.Barmeshwar Singh, elder brother of Com.Chandeswra Singh,GS Passed away at Patna today. He was former CHQ Assistant Treasurer of E3 union. Maharashtra Circle pays homage to Com.Barmeshwar Singh, and conveys heartfelt condolences to Com.Chandeswar Singh and his family. Smt.Balambal, mother of Com.K,Natarajan, CS,Tamilnadu circle passed away today. 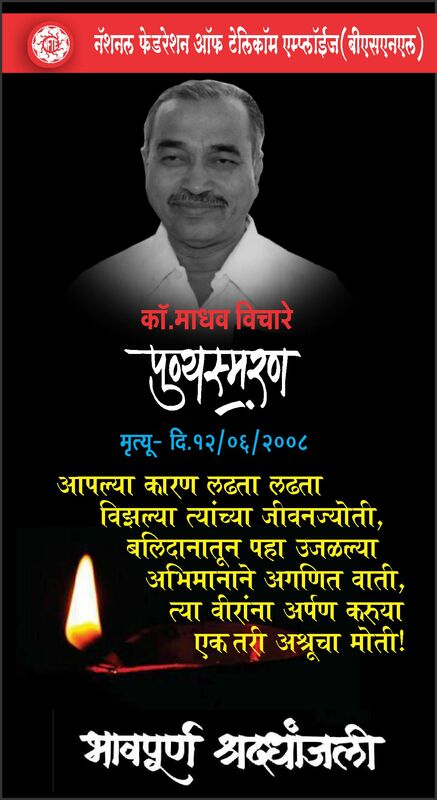 Maharashtra Circle pays homage to departed Soul, and conveys heartfelt condolences to Com.K,Natarajan and his family. Press News Aircel bankruptcy: BSNL approaches DoT for recovery of dues.